A university that enjoys a Five-star status in Australia has extended its brand of excellence to Malaysia through partnership with INTI College Sarawak. Southern Cross University, awarded a maximum of Five Stars for ‘Getting a Job’* and ‘Graduate Starting Salary’**, offers a customised Master of Business Administration (MBA) programme at INTI for working adults. Ideal for those seeking a postgraduate business qualification that gives one a competitive edge in the global markets, the MBA programme allows learners to gain a broad understanding of contemporary management operations, and develop industry-relevant skills and solutions for complex business situations. They will also build on their professional experience by enhancing their leadership, problem solving, and communication skills through practical assessment activities that are relevant to the real world. Trevor Davey, Unit Assessor from Southern Cross University, conducts a workshop for MBA students. Held in the evening (on weekdays) and on weekends at INTI, the programme is delivered by highly qualified and experienced teaching staff. 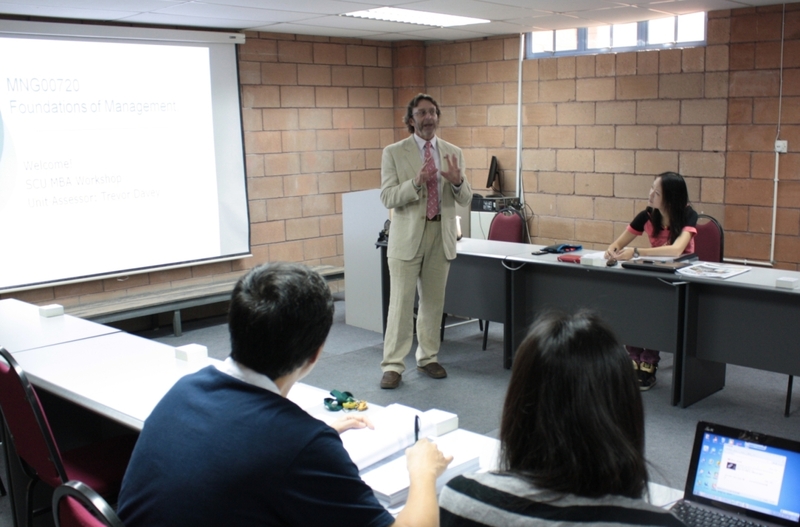 In addition, lecturers from Southern Cross University regularly visit INTI to conduct workshops for MBA students. Learners have the option to study broadly across a comprehensive suite of business disciplines, or to specialize in a discipline that suits one’s career aspirations. The flexibility of this programme allows working professionals to select elective modules which would facilitate the immediate application of knowledge and skills in their respective areas of work. Prior to completing the full MBA programme, students who complete four modules will be awarded the Graduate Certificate in Business Administration from Southern Cross University. On completion of eight modules, students will be awarded the Graduate Diploma in Business Administration. Enrolment to the MBA programme is now open and classes will commence on May 7, 2012. The entry requirements for working adults or students desirous of entering the MBA programme is a degree equivalent to an Australian Bachelor’s degree and applicants must have completed at least one year of relevant work experience. Advanced standing may be granted where a candidate has successfully completed units from previous postgraduate-level studies and which are substantially equivalent in content, standard and duration to units offered in INTI’s Southern Cross University MBA programme. Students of INTI benefit not only from the institution’s over 25 years of experience and strong track-record, but also gain from the global synergy and resources that Laureate International Universities provides. INTI is a part of Laureate, the world’s largest private education network with a presence in 29 countries, with more than 60 accredited universities and 130 campuses, serving more than 675,000 students globally. For further information on the MBA programme, please call 082-570888 or visit INTI College Sarawak at Jalan Stampin Timur in Kuching.